Scene of the Blog Featuring Violet of The Eager Readers! It's a normal part of my Scene of the Blog routine to send reminder emails to participants a few days before their guest appearances here on Kittling: Books. I would imagine most of them really don't need the reminders, but the way I look at it, you never know what's in the future, so be prepared. It just so happens that this week's guest needed the reminder because she's having health issues. 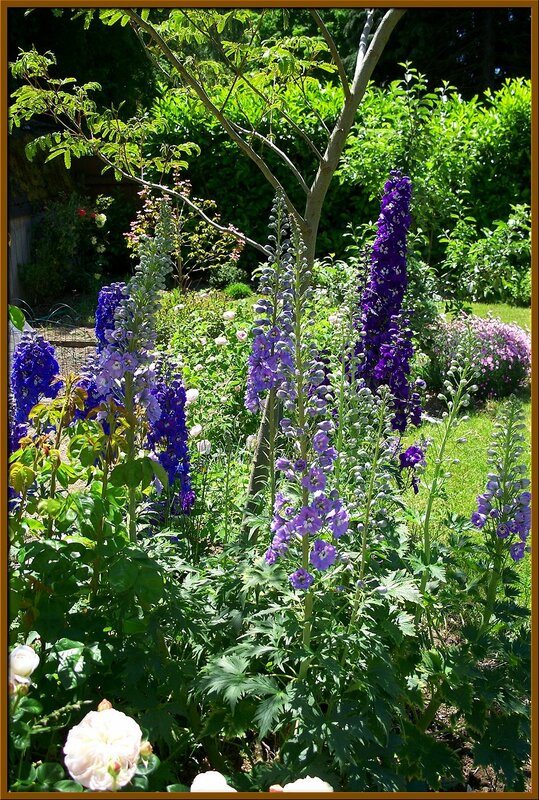 Have you ever visited Violet at her blog, The Eager Readers? The whole family-- Violet, Forest, Primrose and Amethyst-- are voracious readers. On one blog you can find reviews of mysteries, classics, young adult fiction, middle grade books, picture books, board books... they have almost every single base covered! The flower theme isn't just with the names of the reviewers, it's also carried out in the photos used for the blog template. If you want to feel like spring and check out a lot of good book information, please take the time to stop by The Eager Readers. Don't forget to say hi! while you're there, and show Violet some support while she goes through her health issues. Before Violet shows us her creative spaces, here's a little reminder that you can click on each photo if you'd like to see it in a larger size. Take it away, Violet! 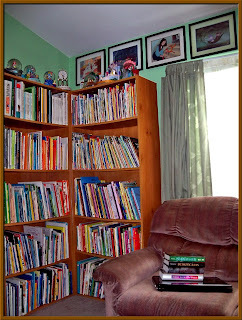 My favorite reading and blogging spot is on the loveseat in our Disney-themed den. Our daughters like to read, draw, and play on the computer in the den, so I often join in on the fun with my laptop and current books in tow. We keep most of our picture books and non-fiction children's books in the den, which makes it a convenient place to take a break from their school projects to read a book (or twenty) together. That particular spot also gives me a view of several things that make me smile - our backyard, our Harry Potter LEGOs, and our Disney snowglobes, pins, and lithographs. The weather is still rainy and cold here at the moment, but I dug up an old photo of my favorite spring and summer reading spot - our backyard. On sunny days, I love to read on our patio while our daughters play in the yard, draw with sidewalk chalk, or collect bouquets of flowers. 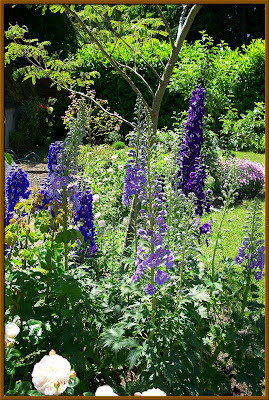 To see more pictures of the flowers in our backyard, check out our Flower Friday posts on The Eager Readers. What a lovely garden, Violet! I love to sit outside to read, too, and I've been planting scarlet verbena, Arabian jasmine, and other goodies to enjoy while I'm outside this summer enjoying my book and my little oasis in the Sonoran Desert. I also love the fact that your entire family reads. When you say that "authors are like rock stars" to you, I get the happy feeling that I've just been transported to Jasper Fforde's world where Thursday Next works in Jurisfiction, and books are THE currency in that world. Violet, I certainly hope the doctors find out what's going on and fix it soonest. 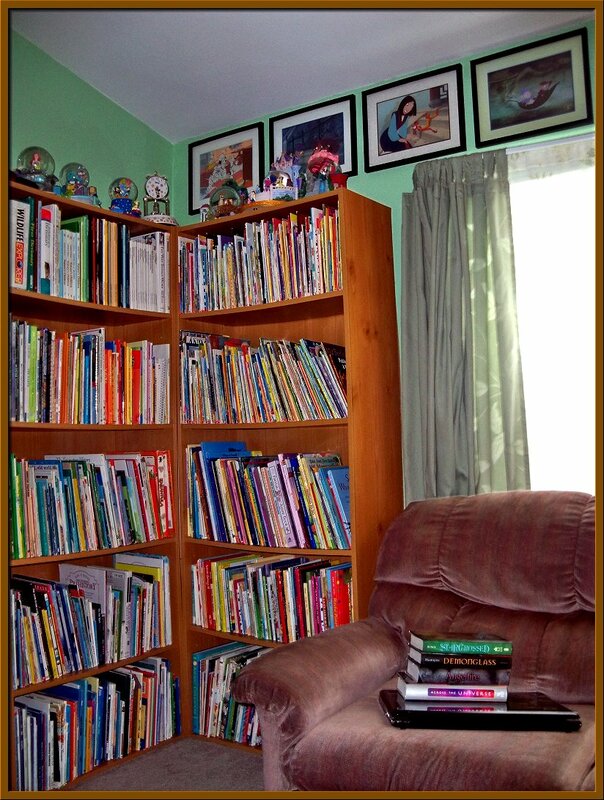 Thank you for raising a family of readers, and thank you for allowing us this glimpse into your home. It's been a pleasure! Who's my next guest on Scene of the Blog? You should know the drill by now-- stop by next Wednesday to find out. See you then! Thank you so much for the kind wishes, Cathy! Your positive and encouraging thoughts are truly appreciated. I feel as though I've been caught in a time vacuum lately, so thank you again for the date reminder. Your scarlet verbena and Arabian jasmine sound so beautiful! Jasmine is one of my husband's favorite fragrant flowers. Your summertime reading oasis sounds lovely! :) Thank you for featuring The Eager Readers as a part of your Scene of the Blog feature! You have a "Disney-themed den"?! Wicked! First of all, Violet, I hope that you can get your health problems worked out. I clicked over to see what was up and I can only imagine how scary all this has been. Positive thoughts heading your way in that regard. Secondly, I love your bookshelves, love your Disney items, and am in awe of the beauty of your backyard. I love purple and oh my goodness! So beautiful. Cathy, thanks for sharing Violet with us! Gorgeous pictures. 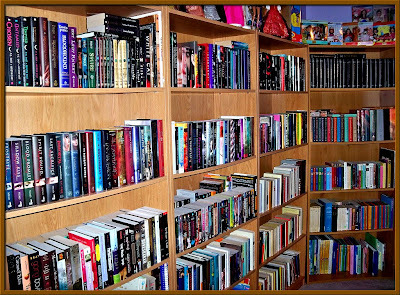 Why is it that we love watching other people´s book shelves? Alexandra - My husband and I have been Disney fanatics for ages, so in a way our den feels like a step down from the Disney-themed living room we had in our early twenties. Wow, what a great space! I could spend a day looking through her books. I want those bookcases! Oh and the yard too. I think I'm moving in. I was sitting here having a hissy fit because I'm having a crown replaced and the dentist told me not to eat until the numbness went away. Then I read about your health problems and thought, What in the world am I complaining about? Best wishes to you in your treatment. I send positive thoughts your way. 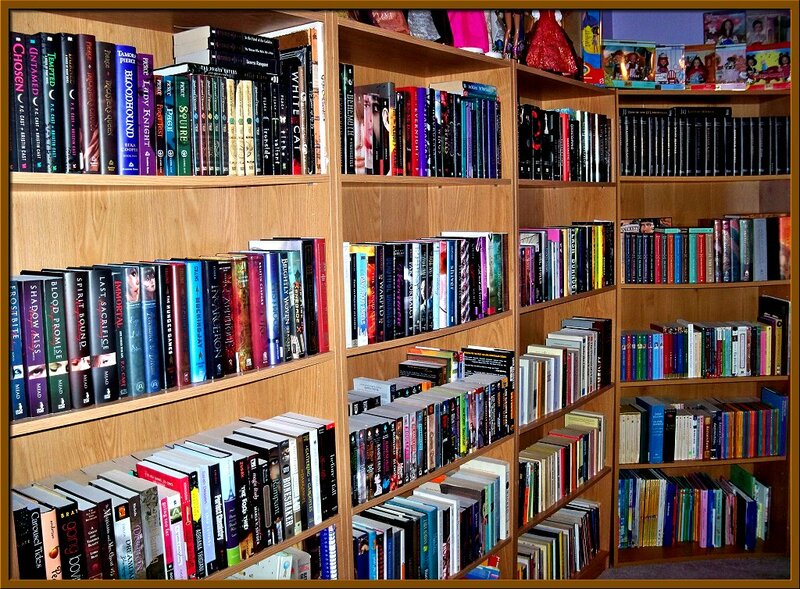 Oh my gosh that whole wall of bookshelves is drool worthy! Violet-- You're so very welcome! Kay-- It's my pleasure. I love doing this feature. I've met so many great people through it!